Combine 1/2 cup water and sugar in a small saucepan. Bring to a boil, stirring until sugar dissolves. Place pan in a large ice-filled bowl for 25 minutes or until cool, stirring occasionally. Place sugar syrup, melon, and remaining ingredients in a blender; process until smooth. Pour mixture into an 8-inch square glass or ceramic baking dish. Cover and freeze until partially frozen (about 1 hour). Scrape with a fork, crushing any lumps. Freeze, scraping with a fork every hour, 3 hours or until completely frozen. 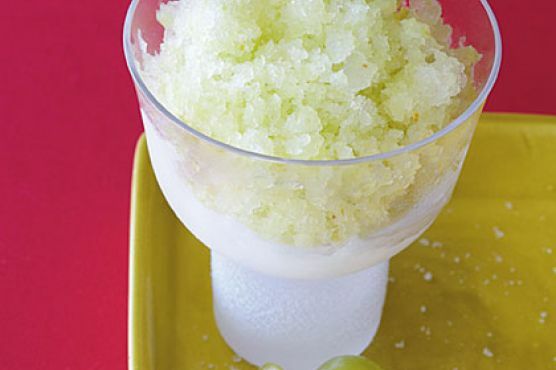 Cream Sherry, Moscato d'Asti, and Port are great choices for Granita. A common wine pairing rule is to make sure your wine is sweeter than your food. Delicate desserts go well with Moscato d'Asti, nutty desserts with cream sherry, and caramel or chocolate desserts pair well with port.